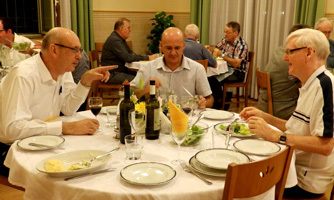 This year's Annual Review Consultation of Marist leaders has come to a close in Rome with a Mass led by Superior-General, Fr John Hannan, and celebratory dinner at 'Monteverde', General House of the Society of Mary. 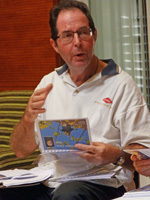 One of the final sessions featured the distribution of the latest Australian-made resources supporting the Cause of Fr Colin. 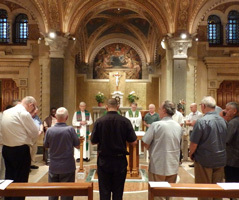 Above: Australian provincial, Fr Bob Barber, assists Fr John Hannan at ARC's closing Mass / a final session of the gathering. 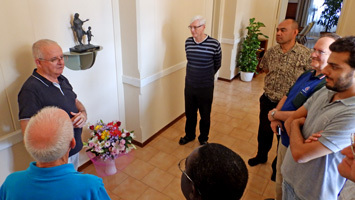 Below: Vicar-General, Fr Larry Duffy, gives an update on the Colin Cause before distributing packs to each ARC participant / Frs Pedro Alarcon (Mexico), Jacques Arguin (Canada) and Didier Hadanou (Africa) with the 'Options for Pilgrims' booklets. | Fr Ben McKenna with the 2017 Colin calendar / Fr John Hannan examines his Colin pack. | Closing Mass / Fr Tony Corcoran leads the Salve Regina at the liturgy's end. | Celebratory dinner at Monteverde. Click here for details of the new Colin resources and how to get them. Following on from 'Our Lady journeys to Rome' (see below) the statue of Mary and the boy Jesus has been given a prominent place in one of the main corridors of 'Monteverde', General House of the Society of Mary, Rome. The statue is a replica of that in the Catholic church of Takada, Japan, and acknowledges the ministry of Marists in Nara prefecture. 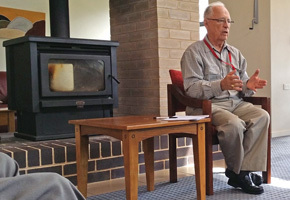 The simple placement by community superior, Fr Tony Corcoran, was made during the ARC gathering and in the presence of Australian provincial, Fr Bob Barber, ARC members and visiting Marists. 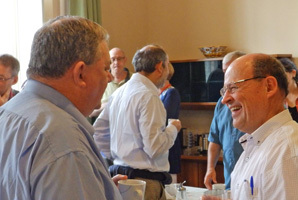 Twelve brothers and priests of the Australian Province are enjoying the first of two retreats to be led by retired Kiwi bishop, Peter Cullinane. 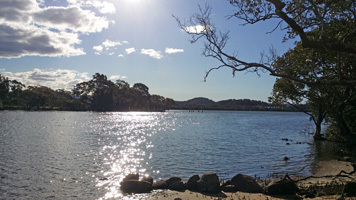 The first retreat (Sep 25-30) is being held at the historic and picturesque retreat haven of St Joseph's, Kincumber, NSW. 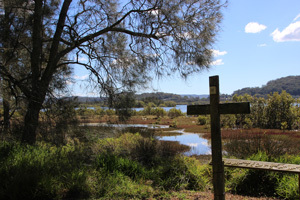 The second retreat, beginning on Oct 02, will be at Maryvale/Montbel, Hunters Hill. 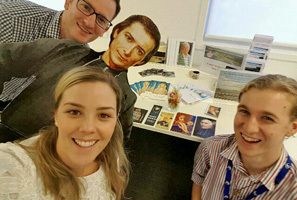 Resources from the Marist Fathers were amongst the wide range of promotional literature at Brisbane's Ignite conference, Sep 22-25, at Rothwell's Mueller Performing Arts Centre. 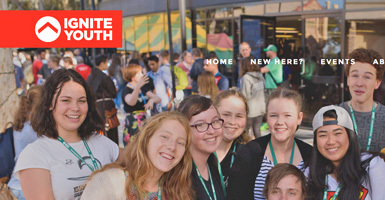 Described as a 'dynamic & contemporary Catholic conference for young people', Ignite each year draws over a thousand young adults, teenagers, children, youth ministers, teachers, priests and religious from around SAustralia. 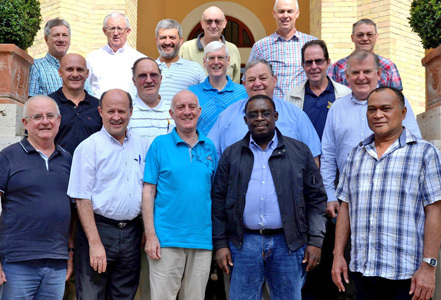 The Society fo Mary's 'Annual Review Consutation' continues with sessions at the General House of the Marist Fathers in Rome. Above: ARC's combined group of provincials, district superiors and general council (Australian, Secretary-General, Fr Tony Corcoran, far left of front row). 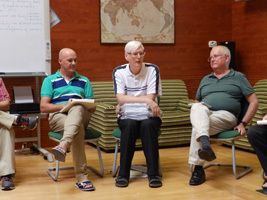 Below: Australia's Fr Bob Barber with Fr Pedro Alarcon (Mexico) / Fr Ben McKenna in session | Oceania's Frs Lote Raiwalui and Ben McKenna. 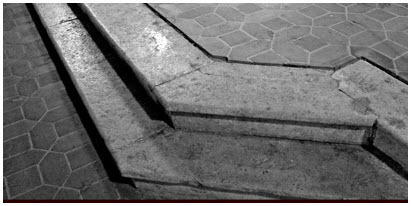 The steps of La Capucinière chapel on which the first Marists knelt on Sep 24, 1836 / .... their signatures, amongst which are those of Jean-Claude Colin, Marcellin Champagnat and Peter Chanel. On Sep 24 the Society of Mary marks one hundred and eighty years since the religious profession of the first Marists in 1836. 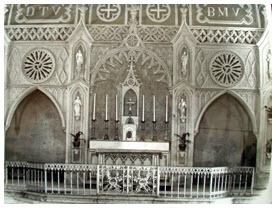 The event, taking place in the chapel of La Capucinière, Belley, France, followed the approval of the priests' branch of the Society of Mary by the mission-minded Pope Gregory XVI. 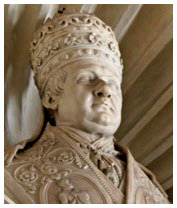 On the same day a reluctant Jean-Claude Colin was elected superior-general. 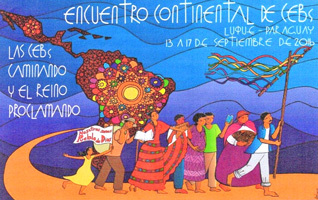 The Misioneros Maristas team, led by Australian, Fr John ('Hoppy') Hopkinson SM, has represented Bolivian Basic Christian Communities at ten anniversary convention in Luque, Paraguay. Above: Asia-Pacific Marists at ARC, from left: Frs Pat Devlin (Asia District), Ben McKenna (Oceania), Bob Barber (Australia), David Kennerley (NZ) and Lote Raiwalui (Rome) / Opening of ARC 2017. Below: Aussies, Frs Bob Barber, Tony Corcoran and Ben McKenna. Marist provincials and district superiors have begun their Annual Review Consultation in Rome with the General Council of the Society of Mary. 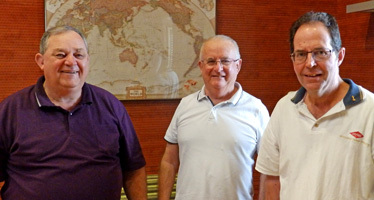 Australia is represented by Fr Bob Barber with fellow-Australians, Frs Ben McKenna (Oceania) and Tony Corcoran (Secretary-General). 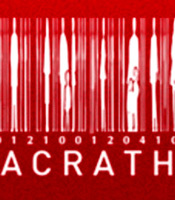 Click here for Spring issue. 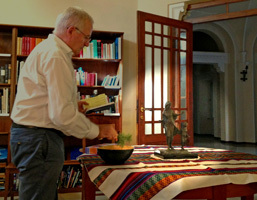 Fr Bob Barber has left for the Annual Review Consultation (ARC) meeting of Marist leaders in Rome. 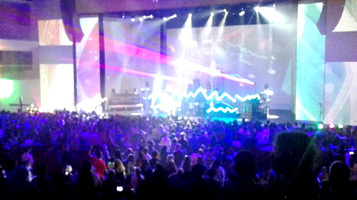 Provincial and District Superiors will gather from Africa, Asia, Australia, Brazil, Canada, Europe, Mexico, New Zealand, Oceania, Peru and USA. 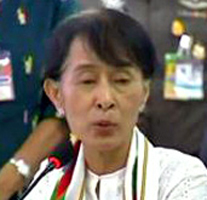 They will meet for two weeks with the General Council of the Society of Mary. 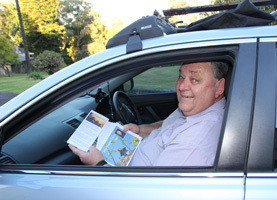 Fr Bob is carrying a consignment of Marist travel resources and the annual 'Colin calendar' for his fellow-leaders. Ex-students at the Traralgon celebrations, from left, Peter Mitchell, Jo Crisp, Paul Apostoleros, Br Bill Dillon and Fr Paul Sullivan, who represented the Marist Fathers. 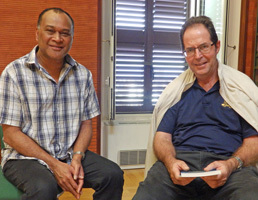 Paul Apostoleros still writes regularly to former St Paul's teacher, Fr John Hill SM. On Sep 09 Sale's Bishop Patrick O' Regan celebrated a sixtieth anniversary Mass for Lavalla Catholic College, Traralgon, Victoria. 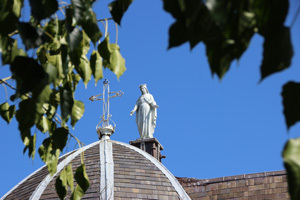 The event acknowledged the role of four religious congregations in the formation of the college: the Presentation Sisters, Marist Fathers, Brigidine Sisters and the Marist Brothers. 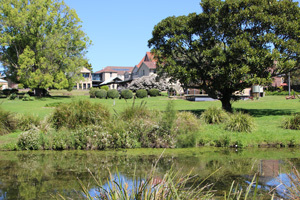 The original college (St Paul's) was established by the Marist Fathers in 1956 with Fr Harry Davis as the first rector, followed by Fr Steve Maloney. Lavalla now has over 1200 students. Sep 12 is the Feast of the Holy Name of Mary when Marists give thanks for their vocation 'by a gracious choice' from the Blessed Virgin. 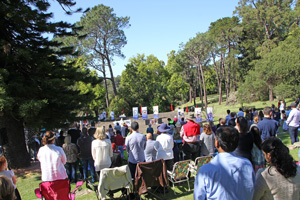 Under brilliant spring sunshine and blue skies, families of Holy Name of Mary parish (Hunters Hill/Woolwich) gathered on Sep 11 for their patronal feast day Eucharist. 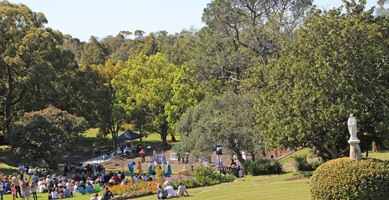 Frs Kevin Bates and Willy Melteras concelebrated the Mass in the grounds of Villa Maria monastery, Hunters Hill, remembering the promise 200 years ago to form the Society of Mary and anticipating the actual feast day, Sep 12. 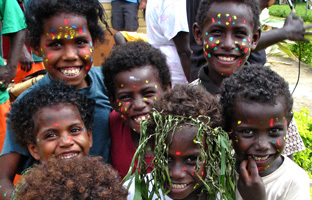 Worth checking... the 'feature photo' of the Oceania Marist Province web site each week. 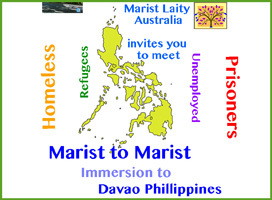 Marist Laity Australia and St Patrick's Church Hill now have details of the Marist-to-Marist Philippines immersion experience planned for January 2017. An information session will be held on Sat, Sep 10, at 11 am in the crypt of St Patrick's for keen and interested persons. 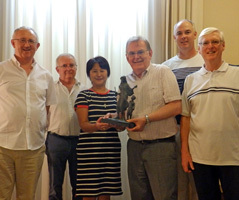 A second replica statue of Our Lady of the Journey has been presented to the Marist Fathers. The gift was blessed by Australian, Fr Tony Corcoran, community superior of 'Montverde', General House of the Society of Mary in Rome. An initiative of Maria Sachiko Yamoto (pictured below with her grand-daughter during their recent Sydney visit - see story in 'August news') the two replicas of the original statue in Takada, Japan, symbolise the gratitude of the Catholics of Nara prefecture for the ministry of Marists across the years. Good news from Thailand and Burmese Kachin student, James Brangnu, graduate of the Marist-sponsored Bridge Program (2013) and Australian Catholic University's Thai-Burma border online course (2014-15). 21 yr old James is the latest 'BP-er' to be granted a university scholarship. Bangkok's UTCC (University of the Thai Chamber of Commerce) has offered James a place in their four-year program in business administration. 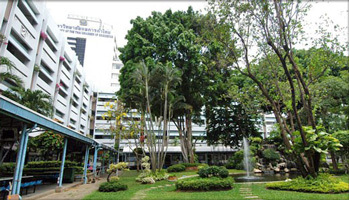 Below: UTCC's Bangkok campus. | James (2nd from right) on opening day at UTCC / ... with fellow 'BP-ers' in Maesot, Thailand. 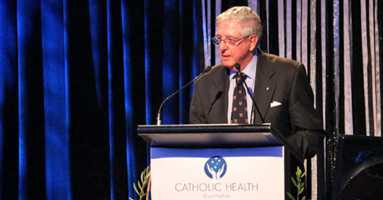 Australia's peak body for Catholic health care has awarded Fr Gerald Arbuckle SM its highest annual award. The Maria Cunningham Lifetime Contribution Award was presented on Aug 30 to Fr Gerry at the annual conference of Catholic Health Australia in Sydney acknowledging his 'lifetime’s dedication to Catholic health and aged care in Australia and North America'. CHA co-ordinates the largest Australian network of hospitals and aged care facilities. Congratulations, Fr Gerry! 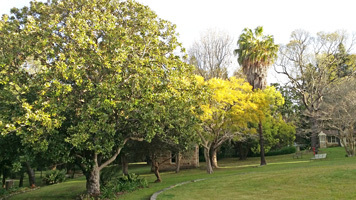 ... in the grounds of Villa Maria monastery. 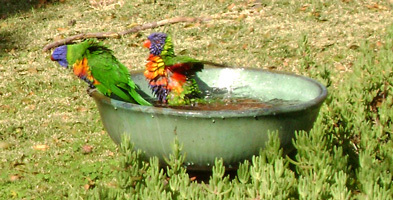 'All you plants of the earth, all your birds in the sky, O bless the Lord'. 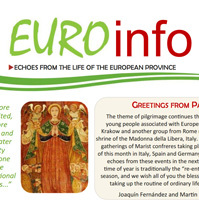 Latest 'Euroinfo' from the Marist European province.